An alligator lizard has set up camp in our geraniums. 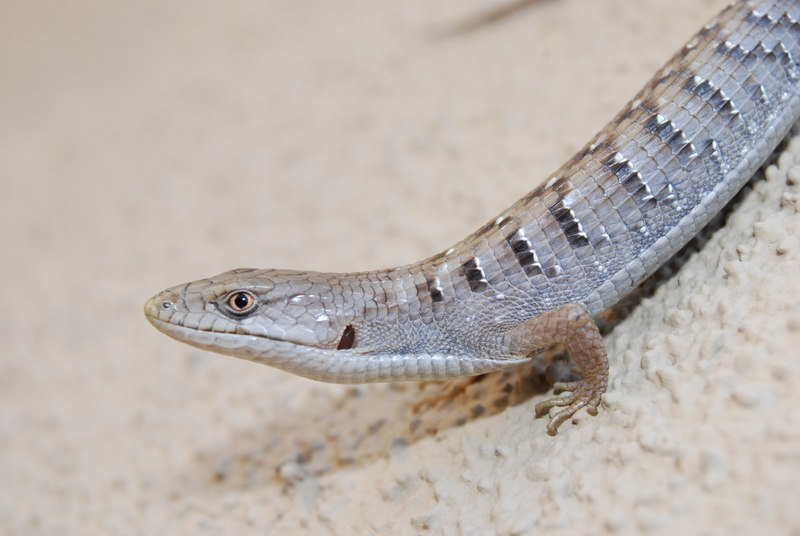 The alligator lizard, nicknamed Al, moved in as a youngster. Back then, he was small enough to slink up the trellis when he was scared, and pretend to be one of the stringy green beans. Alligator lizards are location-tenacious. They stake out a spot, and don’t like to move from it. Al’s now a stout seven inches long, with stubby legs and a thick prehensile tail. The gold and grey dino-like pattern on his back contrasts well with the pretty fuchsia flowers. And Al doesn’t like getting wet. When I water the garden, Al will sometimes be courteous and scoot slowly out of the way, nestling under the nearest garden gnome, where it’s dry. Other times, he’ll appear out of nowhere and dash madly toward my feet, then zig-zag his way to alternate cover, hiding behind a half-used bag of charcoal. Al doesn’t run like a regular lizard. He moves like a snake, swinging his hips with each slithery step. I love Al, but when he pops out of nowhere, frantically undulating across the patio, he can really freak me out. Sometimes I wish he would act more like a normal lizard, like the fence lizards our neighbors have. I think some people feel the same way about getting involved with someone with Asperger’s. It’s easy to see danger in differences. The western fence lizard might offer a more predictable pattern of behavior but I really appreciate the unique gifts of the alligator types. Like location-tenacious Al, my Asperger’s husband is loyal and devoted in a way I never thought possible. Also like Al, Tom surprises me every day with unpredictable reactions – witty comebacks that make me laugh, or penetrating observations that make me reconsider my assumptions. Relationships are complicated and neurological differences are only one part of them. Still, when making assumptions about people, whether western fence NT’s or Aspie alligators, it helps to look beyond the knee-jerk reaction – the fear that a funny looking lizard is going to scare you, hurt you or nip at your toes. Sometimes the best things in life don’t look the way we had expected. We all have alligator parts to us, darting around and trying to connect. And maybe our next great connection is already here, nearby and accessible, just hidden beneath the flashy flowers.